I had an issue where I had to change out the driver ESXi uses for it’s QLogic fiber channel hbas. Below is the procedure I used to make the change from the qlnativefc and qla-2xxx driver sets. I was running ESXi 5.5, but the procedure for other versions is likely similar. ESXi hosts with Qlogic adapters use the qlnativefc driver out of the box. Download the qlogic driver for Vmware. Extract the zip file and find the offine_bundle.zip file if it’s not already extracted. SCP the offline bundle file to a datastore on the ESXi host that all of the other hosts can see. This entry was posted in Virtualization and tagged fiber channel, vmware on May 28, 2015 by Brandon. I recently setup NPIV for several of my VMs in my production environment. Let’s just say it was an adventure. I wanted to detail my experience below, including some step-by-step instructions for setting it up and some advanced troubleshooting I had to do to resolve my issues. My environment consists of VSphere ESXi 5.5 hosts with Brocade DCX backbones. Though this setup revolves around my particular setup, the steps here should work with most setups. NPIV is the process where a Fiber Channel switch port can advertise multiple Port WWPNs for the same fiber channel connection. 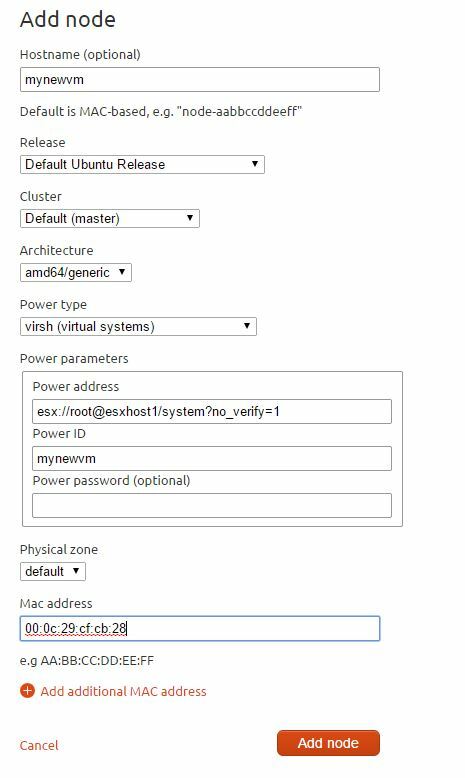 This allows you to have a single switch port represent the WWPN of an ESXI host port and also a virtualized WWPN assigned directly to a VM. Cisco UCS also does this, with the physical ports of the edge device representing the different virtual WWPNs of the different virtual HBAs on the service profiles provisioned on the Cisco hardware. This is useful when you want to identify a particular VMs fiber channel traffic by identifying it by its own unique WWPN. Also, with Hitachi Server Priority Manager (QOS), you have to assign QOS limits by selecting a WWPN to assign a quota to. Without NPIV, the best you could do is limit the ESXi server HBA to a limit, thereby limiting ALL vms on the ESXi host. We use VirtualWisdom, which is a Fiber Channel performance and health monitoring software package made by VirtualInstruments. With NPIV, we can now trace IOPS, MB/s and latency right to the VM as opposed to ESXi HBA port. NPIV has some strict requirements, and failing to adhere to them can give you headaches. NPIV can only be used in conjunction with RDM devices. .vmdk disks from a datastore are still identified by the ESXi host’s wwpns and cannot use NPIV. You have to make sure the NPIV wwpns are zoned to see ALL STORAGE the cluster hosts can see, even if the VM does not attach to the storage. 1) First, shut down the VM. 2) Log into the vSphere web client and find the VM in your inventory. 3) Edit the settings of the VM. 7) Select the appropriate number of wwpns vs wwnns. For one FC fabric, one WWNN and one WWPN should work. For two, I’d do one WWNN and two WWPNs to simulate a dual-port HBA,each connected to one fabric for redundancy. 8) Click OK and exit. Connect your RDM to it at this time. When we are done, the VM should be accessing your RDM via your NPIV-generated wwpns. If this fails for some reason, it will fall back on the wwpns of the ESXi host HBAs. Remember, it will ONLY see RDMs this way, not .vmdk disks sitting in a datastore. This ALWAYS go through the ESXi host wwpns. Now, before you power up the VM, you have to set the zoning and LUN masking or you will have issues while booting or vMotioning it. 2) Create your zones. Recall that you *must* zone the NPIV wwpn to ALL storage systems your ESXi cluster hosts can see, even if the VM will never see or use the storage! 3) Save and commit your config. There is some flexibility at this point. Different storage systems mask differently, and I don’t think NPIV will freak out if it can’t see the LUN. In this case, it just won’t work and will fall back to the ESXi host wwpn. Messages like below indicate success. If it posts within a minute or two, you should be OK. If it takes a lot longer, you probably have an issue. If you see errors=0, you should be OK. You should see a vPort per path to the LUN, and no errors. This tells me without a doubt an external system can see the traffic from the VM through the NPIV port. Translated, this means VMK_NOT_FOUND. 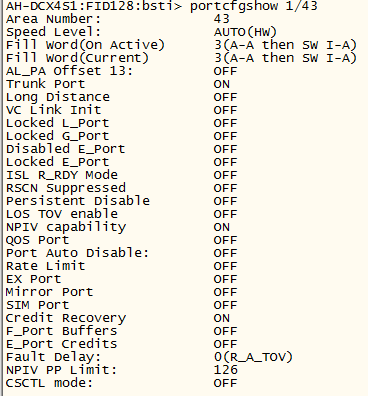 Basically, it means no LUN paths could be found via the NPIV wwpns. In my case, this was due to a bad driver. On my Dell PowerEdge 710/720 servers, I had to install the qla-2xxx driver as opposed to the qlnativefc driver to get NPIV to work. I have a separate post forthcoming that details this procedure. Basically, you can see it creates vmhba64 (This is your virtual NPIV adapter. The number after vmhba varies). It tries to scan for your RDM LUN (Target 3, LUN id 1) and fails. After several retries, it gives up and deletes the vmhba. This was an issue caused by the fact that I did not zone my npiv wwpns to ALL storage systems my ESXi hosts were connected to. We had zoned our ESXi cluster to a NetApp storage system, but at some point disconnected all of the LUNs from the ESXi cluster. Even though the ESXI hosts didn’t need the zones, and the VM certainly did not have any LUNs from that storage system attached, not zoning the NPIV wwpns to that storage system broke NPIV. Then reboot the host for it to take effect. You can see the wwpns of your storage system target ports, followed by the internal ID ESXi assigns to it (01ac00), and its status. In my case, the first two target ports were from the storage system I didn’t realize was connected. 2015-05-04T19:44:08.112Z cpu19:33504)qlnativefc: vmhba64(4:0.0): GID_PT entry – nn 282c000c29000030 pn 282c000c29000031 portid=012b01. 2015-05-04T19:44:08.113Z cpu19:33504)qlnativefc: vmhba64(4:0.0): GID_PT entry – nn 500000000aaa1101 pn 500000000aaa1102 portid=012900. 2015-05-04T19:44:08.113Z cpu19:33504)qlnativefc: vmhba64(4:0.0): GID_PT entry – nn 500000000aaa1101 pn 500000000aaa1103 portid=016900. 2015-05-04T19:44:08.132Z cpu19:33504)qlnativefc: vmhba64(4:0.0): Trying Fabric Login w/loop id 0x0008 for port 012900. 2015-05-04T19:44:08.132Z cpu19:33504)qlnativefc: vmhba64(4:0.0): qla24xx_login_fabric(6): failed to complete IOCB — completion status (31) ioparam=1b/fffc01. 2015-05-04T19:44:08.132Z cpu19:33504)qlnativefc: vmhba64(4:0.0): Trying Fabric Login w/loop id 0x0009 for port 012900. 2015-05-04T19:44:08.135Z cpu19:33504)qlnativefc: vmhba64(4:0.0): Fabric Login successful w/loop id 0x0009 for port 012900. 2015-05-04T19:44:08.135Z cpu19:33504)qlnativefc: vmhba64(4:0.0): Trying Fabric Login w/loop id 0x000a for port 016900. 2015-05-04T19:44:08.138Z cpu19:33504)qlnativefc: vmhba64(4:0.0): Fabric Login successful w/loop id 0x000a for port 016900. The lines that start with GID_PT show the target ports that the NPIV wwpn sees (this is a separate discovery process than the ESXi HBA). You notice it only sees two of the target ports. If we concentrate on the first target port it sees, it’s labeled ID 12900. Later, you see it assigns target id 0 to the target port. However, from the above steps, you can see using the vmkmgmt_keyval command the ESXi HBA sees wwpn 500000000aaa1102 as Target ID 2. They don’t match, and thus NPIV fails to work with the bad0040 error. Once I saw this, I traced the extra wwpns back to the storage system I realized I was connected to and remove it from the zoning of the ESXi HBA ports. After a rescan of the storage on the ESXi cluster and a reboot of the hosts to be safe, I booted the VM up again and viola! Make sure you are meeting all of the requirements for NPIV. VERIFY you are zoning your NPIV wwpns to ALL STORAGE SYSTEMS the cluster can see, even if it will not use any storage from the storage systems. 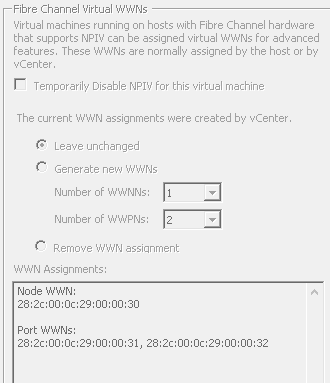 Be aware that if you connect any new storage systems to a cluster with one or more NPIV-enabled VMs, you will need to add the new zones so the NPIV wwpns can see the new storage system target ports, or it will probably start failing. This entry was posted in Fiber Channel, Virtualization and tagged fiber channel, npiv, vmware on May 19, 2015 by Brandon. I run a VMware ESXi (free edition) host server with several VMs in my home lab. I’ve been on the lookout for some time for a backup product for them. Since I’m not a company, I prefer the price of “free”. There are some products out there, but most of them have onerous requirements unless you get the “pay” version, which is pretty far out of most of our price ranges. Below I’ve detailed my setup experience and how to get your own free backups running. – Thinware vBackup is a Windows product. You need a Windows machine to run the backup software from. – For the free version, you need VMWare Converter Standalone installed on the Windows backup machine. – You also need the VMware Virtual Disk Development Kit from VMware’s website. First, you need to visit Thinware’s website and register for an account. Registering is free. Once you’ve done that, you can download the latest vBackup product version (v 4.0 as of this writing). Decide which Windows machine will run your backups. Then install the product on that machine. Once installed you can launch it and it will immediately complain about licensing. 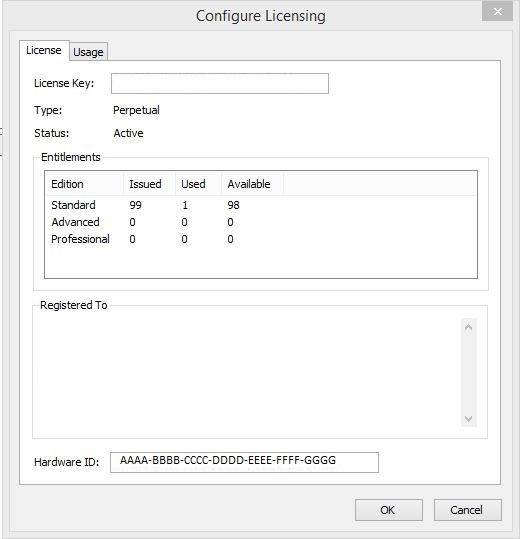 Go to the licensing screen (Click “Tools” in the drop-down menu and select “Configure Licensing”). The licensing screen will show you the hardware ID of your machine. You *must* make sure and do this from the machine you will be running your backups from! I’m pretty confident the key you get will only work on that machine. Once you’ve obtained your Hardware ID, then you go to the thinware.net site again, click the Products tab then click the Request a License link under the Standard Edition column. Fill out the form thoroughly. Do not forget to fill out your organization name (or your name if this is for personal use) and your FULL address (be sure to include City, State, and Zip code) Also fill in the contact name and e-mail address. If you forget to include all of this, your license will be denied (then you have to do it again). They will email your license key in a few days. Plug they key into the licensing screen on the software and you are ready to rock. Once you are licensed, you have to tell Thinware what VM hosts and VMs it will be dealing with. 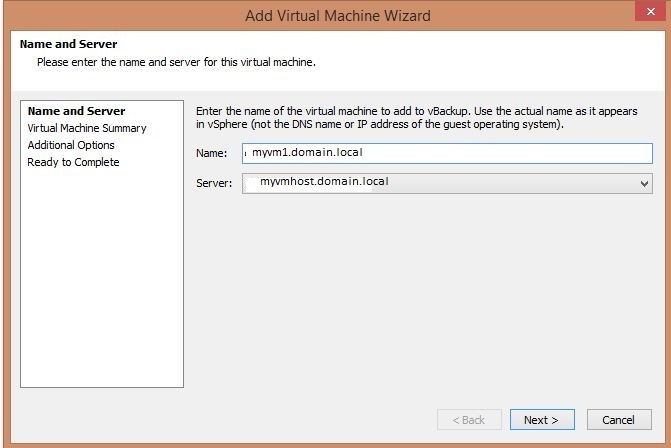 For each VM host, click Inventory -> Add Host server. Incidentally, the software supports connecting to vCenter but that’s outside the scope of what we’re doing here today. Fill in the details of your server including hostname and login credentials. 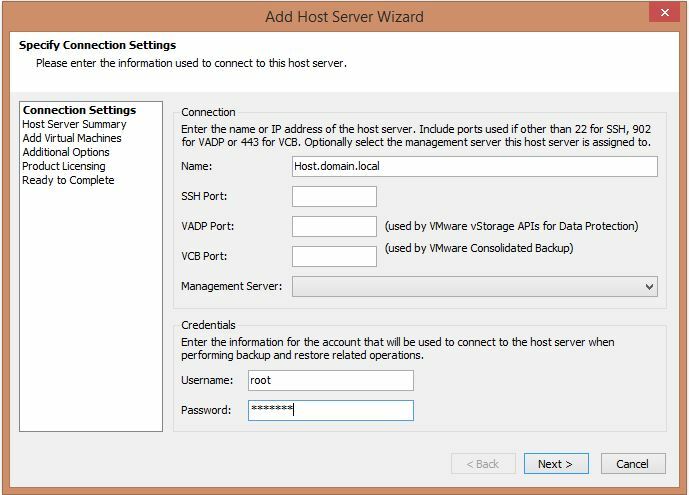 The port defaults will suffice in most environments and Management Server only applies if you have a vCenter server running. The next screens allow you to review your details, validate connectivity and add any VMs discovered on the host. In my environment, it didn’t detect the VMs automatically. I had to add them later. Finally you assign a license to the host, review the settings again and finish. Right-click the newly-added host and click “add virtual machine” to add new machines. 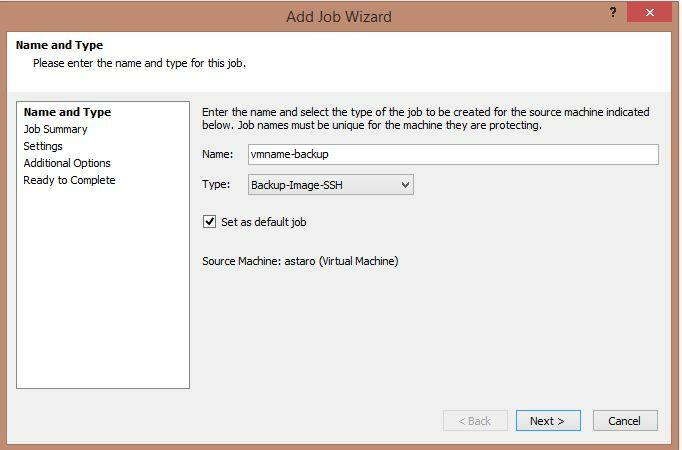 Before you can run backups, you have to define a backup job for each VM. Click a VM and on the left-side pane click the Jobs tab. Right-click the empty pane below and click “Add Job”. This is the only option you must choose if you are using the free version and are running ESXi 5.x. NOTE: The SSH service needs to be enabled on the host server. This only works with the “paid” version of VMware VSphere. Uses the vStorage APIs to perform the backup. This uses VMware Consolidated Backup, which must be installed on your machine. I chose the Backup-Image-SSH, which works great for a small home environment with free ESXi. On the next screens, you specify the root directory you want your backups to go in (e.g. C:\thinware). It will create a subfolder for each VM automatically when you run the first backup. Specify the number of backups to keep before it automatically purges old backups. Disk Exclusion is cool, and allows you to skip certain virtual disks from the backup process. However, this does not work with the standard (free) version of Thinware. The next screen has you configure quiescing of the guest file system (recommended). Compression can be configured here too at three levels: none, basic and advanced. Unfortunately, you can’t choose any compression if you have the free version of Thinware. Once complete, you submit the job and it shows up in the jobs pane. You can right-click it and “Execute Now” to run it on-demand. Easy enough. Each backup takes a full image backup of the VM. Depending on how large your .vmdk files are, these can get rather large. With the free version, there’s no differential/incremental type backup scheme. For the price in a home lab though, I can’t complain. This entry was posted in Virtualization and tagged backup, thinware, vmware on September 27, 2014 by Brandon.